Some pet owners think that treatments for fleas, ticks, and other parasites only need to be done in the spring, summer, and early fall. However, studies reveal that these issues are just as much of a threat to the health and safety of your pets and human family members during the colder months. Because many pet owners let their guard down and neglect parasite preventing during the winter season, they may be more likely to be affected by it more during this time of year than any other. Fall River pet owners who are interested in preventive treatment for pets should seek the advice of a trusted South Coast veterinarian. 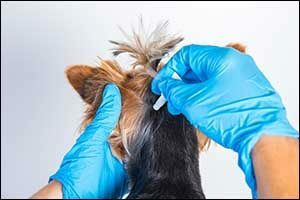 Don’t rely on over the counter (OTC) treatments or the advice of pet shops or other pet owners. Many flea and tick treatments, as well as the threats posed by them, are very distinct to our local area. You don’t want to put your pets or family at-risk just to save a few dollars or because you were unable to make time for a vet visit. Contact Anchor Animal Hospital in Dartmouth to get started on preventive flea and tick treatments, as well as to test your pet’s risk for other parasitic conditions. It is well known that fleas thrive in conditions that are warm and humid. This is why most pet owners only worry about them in the late spring, summer, and early fall in Southeastern Massachusetts. However, a mild winter season can be excellent for both fleas and ticks. In addition, those pests work harder to come indoors when the weather starts to turn cold, living off the warm bodies of your pets and other family members. They take advantage of the artificial warmth that comes from home heating systems and humidifiers. It is essential to protect both your pet and your home throughout the year with the use of veterinary-recommended flea and tick treatments. Fall River pet owners who are interested in preventing a flea or tick infestation in their home can take several precautions designed to thwart an infestation. Start by making an appointment with your South Coast veterinarian for preventive treatment for pets. Even a single flea bite can be too much for many pets, and ticks are dangerous for the whole family. Drops, chew treats, and collars are just some of the options that they may suggest, depending on the age, breed, species, and health condition of your pet. Sprays and powders can also be used inside your home if you already have fleas or ticks present, and shampoos can be used to offer immediate relief from flea and tick bites, killing those pests on contact. Make sure to keep up your preventive flea and tick treatments year-round to ensure complete protection for your pets and the rest of your family members. Don’t leave it up to chance. Make sure to speak with your trusted veterinarian about other preventive measures based on your unique location and your pet’s activity level or lifestyle. Our team will check your dog’s stool for hookworms, roundworms, tapeworms, whipworms, and coccidia. We can check your cat’s stool for hookworms, roundworms, tapeworms, coccidia, and toxoplasmosis. Our veterinary team regularly reviews products according to safety and efficacy, to ensure that our pet patients have the best possible options for prevention. If you are ready to get your pets on track for a healthy and happy spring season, give us a call at 508-996-3731 and schedule an appointment for an exam. Fall River pet owners, as well as pet owners from all over the Southeastern Massachusetts, Rhode Island, and Cape Cod area, have trusted Anchor Animal Hospital to provide quality pet care since 1975. The more you can do in the way of preventive treatment for pets against fleas, ticks, heartworm, and other parasites, the healthier both you and your pet will be.